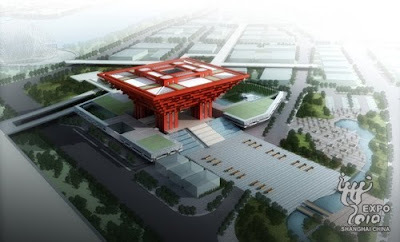 Expo 2010 Shanghai China draws attendees from around the world to the Yangtze River delta. That’s the China Pavilion pictured above. The magnificent red structure at the center is called “The Crown of the East,” and was built in the dougong style, which uses interlocking wooden brackets, and which dates back more than 2,000 years. So perhaps when it comes to imagining the city of tomorrow, yesterday is just as important as today.